Since living in China, behind the iron firewall, I’ve realized how valuable information is. Many times here in Shekou, I have been stared out, or should I say, stared down by numerous Chinese and at times, it can be awkward. But then someone said something about the impact of censorship. I might be the only Westerner or one of a handful they have ever seen. Last year, the government dropped Star TV because it was deemed too racy. Glee? Top Model? But there you go. It’s their decision and I have absolutely no say in the matter. It’s not the television program so much as how much control a government wants to and has over what I see, when I see it, and even if I see it. But look, I am not going to get into politics. In many ways, China has been very good to me. Plus, I can get take-out for about $5 so really, I can’t complain. However, take right now for instance. Uploading one photo to Twitter took 10 minutes and one restart. I also want to invite a friend to Google+ but the wheel just keeps on spinning as I search for her gmail address. Frustrating, that little wheel. So when I attended a tech conference in Shanghai last weekend, I left with mixed emotions. On one hand, it was very exciting. Technology is so full of promise and opportunity. On the other hand, do you know what it’s like when your house is a mess, I mean a disaster zone and instead of cleaning it, you just have some ice cream and watch a movie? That’s how I felt as well. Overwhelmed to the point of non-action. Take for instance Twitter. I hadn’t thought much of Twitter in the past. I have an account, but didn’t really know how to use it. Plus, is what I tweet valuable to anyone but myself? So at the last minute, I decided to attend a workshop on the benefits of this program. I glad I went. It just seems that there is a new way of sharing out there. Right now, it feels about as comfortable to me as a four-hour root canal. By nature, I am a private person. I am warm and open, but I would also say reserved until I get to know you. I just like to know what I am dealing with before I put out all of my cards on the table. And probably double so at a tech conference where I wonder if I have anything to bring to the table of value. So, it’s with promise but also trepidation that I test this new world of what I call, the Overshare. There was this speaker/presenter there named Jabiz. He let’s it all hang out and openly admits he over shares. And if I were to be completely honest, that buttoned up reserved side of me was like, really? For instance, at the conference there were two presenters that happened to be brothers and they had some good things to say, so in an effort to build up my Twitter professional resources, I follow them now. A funny thing happened though. As I read through the latest and greatest tweets, I felt like I picked up the wrong telephone line and was listening to a private conversation between family members. It wasn’t as if they said anything bad or secret, but I don’t even like to write that I love you to my nephews on Facebook because for me, that’s private. Not everyone feels that way, and that is okay too. For me, uncomfortable. But when listening with my heart, Jabiz was inspiring and motivating. When I saw him in the hallway, I thanked him for helping me looking that the Overshare in a new light. I think of artists, writers, photographers… people who touch my heart and soul with their passion and I think, cheers to them for putting it out there. Well, maybe this new Overshare is really just my chance to put it out there in a public forum. Maybe this Overshare is why I upended my life to move across the world. Time to open up and let it all hang out. I will probably never be as open as Jabiz, but my Twitter photo finally loaded. I already received some feedback from another presenter from the conference and I am having a quick ‘tweetersation’ (tweet and conversation combined) about the benefits of Aperture. So, maybe I do have something to contribute after all. And when it comes down to it, at least I am getting up to bat. And that feels pretty good. What a great ‘take’ from your Shanghai trip – awesome when that happens! 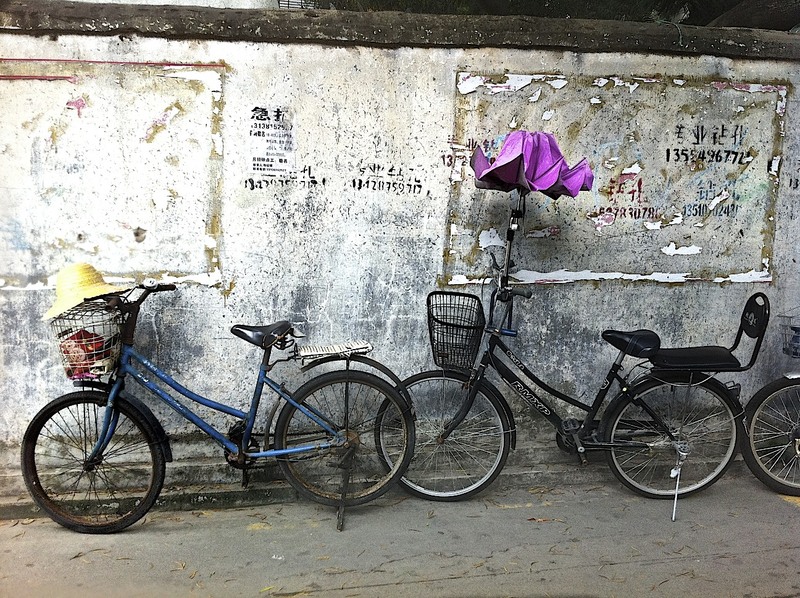 Love the bicycle photo – the pink/purple umbrella on an otherwise ordinary bike made me really think about the beauty of the ordinary on many different levels. Thanks Claire! Wow! Thanks for such kind words. It is always nice to hear that what you do impacts and inspires others. I wish I had the energy to really get into this post, but I may have to come back. All I know is that I, like many people, am dealing with the idea of private versus public, constantly asking myself what it is that I value as private and why? I am constantly testing the boundaries of a total public life, in the belief that we never know what might connect us with others. I like the idea of open human beings. People who can deal with the passion as well as their doubt publicly. I believe in the power of vulnerability as an empowerment tool. I guess I see art as a very public tool and I see my life and the way I live it as an art form. So I am not saying that what I do is for everyone, but I do suggest you ask yourself what it is about privacy that you find so appealing? What is frightening about sharing? Then try and reach out. Soon you will be amazed and the conversation that could form. As for the feeling of butting in, remember we all know that Twitter is public, it may feel like butting is, but really it is like mingling. You hear conversations that sound interesting, then jump in, if it was meant to be exclusionary it wouldn’t be on Twitter. Hope that all makes sense, looking forward to future chats online. Nice to meet you. Till next time.